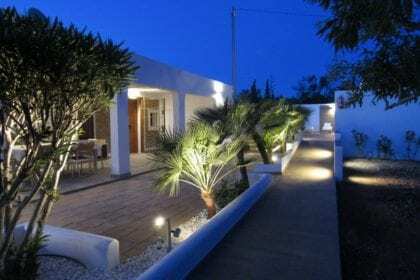 This Ibiza Town / Playa den Bossa villa comfortably sleeps 15 guests. Villa Daniel is a beautiful, large villa in the Playa den Bossa area. This 400-year-old typical Ibizan finca was one of the original country farmhouses of this location – Sa Carroca. 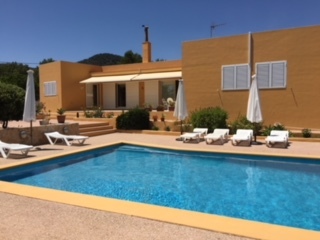 Just outside of Ibiza Town, it’s a popular & convenient villa rental area. Very spacious rooms with good en suite access. Lovely pool with lots of space to relax. Very clean and tidy. Spacious, great pool, good location. We enjoyed our stay at both Villa Daniel and Villa Ania and would definitely recommend you guys to friends planning to visit Ibiza. Everyone had a fantastic time at the villa and just wish we were there now!